One of the easiest improvements that can make a drastic difference in a room is flooring. Replace an old carpet floor with easy-to-install laminate flooring. 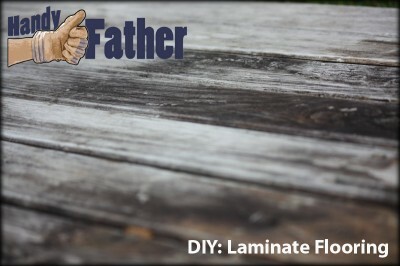 DIY laminate flooring projects can be completed in a weekend. Laminate flooring comes in all price ranges and qualities. I’ve seen laminate for as little as $.75 per foot. Laminate flooring is easy for the DIYer because it is a floating floor, meaning it doesn’t have to be glued or nailed it to the substrate. A foam or felt barrier is often placed directly under the laminate which not only adds padding, but also lessens any creaking and minor bumps in the floor. Laminate flooring can look like virtually any material. From wood flooring to the look of tile, cork and rubber, laminate flooring has your floor covered! Many of the DIY laminate flooring projects I’ve done have been replacing old, unrepairable wood floors. The advantage I’ve found when replacing a wood floor with laminate flooring is that there aren’t many staples or other impediments to remove. You can lay laminate flooring right on top of a wood floor! Sometimes laying laminate over existing wood flooring isn’t an option. If you have doors that swing out over the existing wood floor, and you don’t have a lot of room beneath the door, you may have to remove the old wood flooring, or trim the bottom of the door for proper clearance over the flooring. When removing an old wood floor, be sure to get all nails pulled out of the substrate to give yourself a flat surface on which to install laminate flooring. No floor is much nastier than an old carpet floor. The dust, mold and pet odors make you hate walking through the room. When replacing carpet with laminate flooring, I find the carpet removal easiest if you use a utility knife and cut the carpet into strips about 4′ wide. Then roll it up in sections and remove the sections one at a time. It’s much lighter this way and easier to maneuver through the house. After the carpet is removed, be sure that all padding, staples and nails are removed from the substrate. If the substrate has any mold or water damage, now is the time to make those repairs.